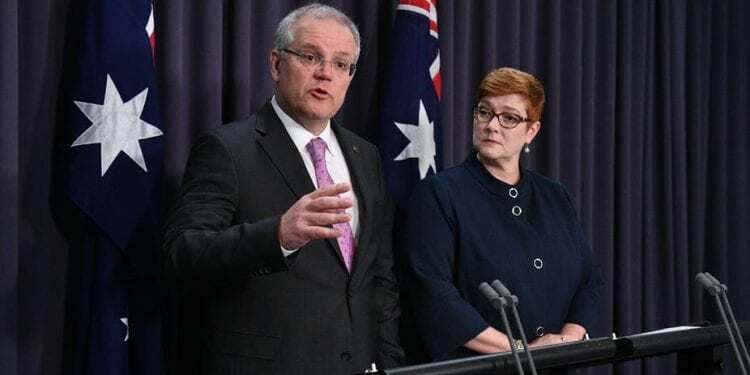 Scott Morrison and foreign affairs minister Marise Payne made a series of major announcements in relation to Israel at a Tuesday news conference. Scott Morrison has announced Australia will consider recognising Jerusalem as Israel’s capital and relocating its embassy there – in a move immediately seen in the context of Saturday’s byelection in Wentworth, which has a large Jewish population. While denying he was motivated by Wentworth, Morrison said the Liberals’ candidate Dave Sharma, a former ambassador to Israel, had set out a way this could be done while maintaining Australia’s support for a two-state solution in the Middle East. I spoke today with Australian PM @ScottMorrisonMP. He informed me that he is considering officially recognizing Jerusalem as the capital of Israel & moving the Australian embassy to Jerusalem. I’m very thankful to him for this. We will continue to strengthen ties between 🇮🇱 & 🇦🇺! The government would “review without prejudice” Australia’s support for the Iran nuclear deal, to determine whether its current policy was still fit for purpose. Australia and Israel would strengthen their defence and security co-operation with the appointment of defence attaches in their respective embassies. The government will announce the results of its review of its Middle East policy by December. In decisions hugely controversial internationally, President Donald Trump last year announced he would move the United States embassy from Tel Aviv to Jerusalem, and he has abandoned the Iranian deal. The Liberals have been making a big pitch for the Jewish vote in Wentworth, on the back of Sharma’s diplomatic experience. His major opponent, independent Kerryn Phelps, is Jewish. In a May article, Sharma wrote of the US embassy move: “Now that the United States has broken the taboo, as a pragmatic and solution-oriented nation Australia should be prepared to lend our support to this common-sense proposition. But in June, Morrison said of such a proposal: “It’s never been under review and we’re not doing it.” On Tuesday he explained his change by saying that then he was treasurer, articulating the government’s policy “as it existed at the time”. Labor was scathing about the announcement. Shadow foreign minister Penny Wong said that “today we see just how desperate Scott Morrison is … to hold on to the seat of Wentworth. She said the move Morrison was floating “is a position that was not held by Alexander Downer, was not held by Julie Bishop, was not held by Malcolm Turnbull – and guess what, wasn’t held by Scott Morrison just a couple of months ago. The Executive Council of Australian Jewry, the peak representative body of the Australian Jewish community, welcomed Morrison’s announcements. On another front, the government has been forced into an about-face on its extraordinary support on Monday for Pauline Hanson’s (unsuccessful) motion declaring “It’s OK to be white”. On Tuesday the government was in full retreat, saying Coalition senators had voted for the motion due to an administrative mistake. Attorney-General Christian Porter blamed his own office. He said in a statement: “An early email advising an approach on the motion went out from my office on this matter without my knowledge. “It appears that, of the very large number of motions on which my office’s views are routinely sought, this one was not escalated to me because it was interpreted in my office as a motion opposing racism. The associations of the language were not picked up. Had it been raised directly with me those issues would have been identified.